At first glance, you might not see the special qualities of Bolivar Flats, a unique area combining salt marsh, mud flats and beach, each habitat quite different from the other. 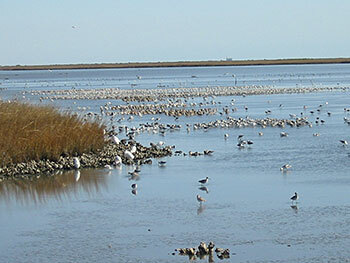 Every year hundreds of thousands of birds discover that Bolivar Flats is a special place. Here they find a resting place and nesting habitat where a smorgasbord of invertebrates and fish is spread. Decomposing plant material derived from the salt marsh and delivered by the coastal currents feeds millions of small worms, shrimp and clams which live in the mud flats. Thousands of birds, small fish and crabs hunt the shallows for these invertebrates and small fish that venture into deeper water. Bolivar Flats is a Globally Important Bird Area, the highest designation, and an International site in the Western Hemisphere Shorebird Reserve Network. People are encouraged to walk along the beach and enjoy watching the birds and other wildlife that is protected here. Observe wildlife from a distance at which they feel comfortable. Walking in vegetated dunes and marshes is discouraged. These areas contain hidden nests and venomous snakes. The vehicular barrier was erected to protect nesting and roosting birds, most of which live on the ground. In addition, vehicles compact the sand, killing the plants and animals that live there and making it more difficult for birds to find food and cover. Regulations also prohibit fires in the sanctuary.